Throughout its long history, drama documentary has been one of film and television's most popular, but also most controversial, forms. Film and programme makers are attracted to its combination of the languages of drama and documentary either to dramatise research, thereby stimulating interest in issues through empathy with characters and narrative, or to apply documentary style to fictional content, thereby enhancing its immediacy. However, critics and theorists continue to debate the extent to which these techniques 'blur the boundaries' of fact and fiction, 'dupe' viewers and sacrifice factual accuracy to dramatic storytelling. The British drama documentary has its ancestry in the British documentary film movement, which often reconstructed previously-witnessed or researched events. This reconstruction could take the form of illustrative detail, as in Robert Flaherty 's staging of Eskimo life in Nanook of the North (1926) or Basil Wright and Harry Watt 's use of a mocked-up mail train in Night Mail (1936). However, reconstruction could also involve substantial fictionalisation, as with the visual style of fiction films or scripted narrative and characterisation employed by Humphrey Jennings in Fires Were Started (1943). In postwar television, the drama documentary emerged as a distinct form in the work of programme-makers like Robert Barr , Caryl Doncaster and Duncan Ross in such BBC productions as I Want to Be a Doctor (1947), It's Your Money They're After (1948) and The Course of Justice (1950-51). Despite being billed as documentaries, these programmes were largely reconstructed, which was justified in terms similar to those used by the documentary film movement, in particular technological impediments to observation: for instance, Wright and Watt could not have filmed their sequences in a moving mail train. In situations like these, or when sensitive subject matter restricts access to interviewees, there is often, to quote one historian, 'no other way to tell it' than to reconstruct events or invent dialogue. However, the drama documentary remained attractive even when it was no longer dictated by technology. Since the 1960s, dramatists and journalists alike have developed variations of drama documentary technique. Granada Television 's dramatised documentary department, led by Leslie Woodhead , dramatised sequences for such documentary strands as World in Action (ITV, 1963-98) and made dramatised documentaries which extended the social reach of current affairs investigations. Granada's distinctive tradition within the form, before and since Woodhead's involvement, includes Invasion (ITV, tx. 19/8/1980), on Communist Czechoslovakia; Hillsborough (ITV, tx. 5/12/1996), on the football stadium disaster; and Who Bombed Birmingham? (ITV, tx. 28/3/1990), on the Birmingham Six - an example, like the BBC's To Encourage the Others (BBC, tx. 28/3/1972) and ' The Legion Hall Bombing ' (Play for Today, BBC, tx. 22/8/1978), of the miscarriage-of-justice piece to which drama documentary is well suited. However, depicting real people can present legal complications. Classification, too, can create problems. Julian Glover complained in the press when Invasion was described as a work of fiction by BAFTA and so overlooked, as a result of BAFTA's policy towards all drama documentaries at the time. There are many examples of such contested definitions. The variety of subjects and stylistic approaches which different programme-makers have explored has led to numerous descriptive terms - including dramadoc, faction, trauma drama or reconstruction - with subtle distinctions in meaning. Definitions have shifted over the years - for example, Coronation Street (ITV, 1960- ) and Z Cars (BBC, 1962-78) have been described as story documentaries because of their dramatisation of prior observation. One key distinction is that between the 'documentary drama' and the 'dramatised documentary'. The first category labels those programmes which are largely dramas, but have documentary value in terms of research and are shot in a style influenced by documentary. The second describes those programmes which are largely documentaries, with documented journalistic research which could include transcripts, but also contain elements of dramatisation. However, a rigid classification remains elusive. If the Leslie Woodhead tradition could be categorised as dramatised documentary, it is the documentary drama category that has sparked the greatest controversy. For a generation of dramatists within television single drama, the decision to mix drama and documentary was taken for aesthetic, and often political, reasons. Peter Watkins evolved a style which brought documentary conventions to hypothetical content, a style which he called the 'reconstructed newsreel'. However, whereas Watkins ' Culloden (BBC, tx. 15/12/1964) was acclaimed for bringing alive a historical event, his later The War Game (BBC, 1965; eventually tx. 31/7/1985) was banned and vilified. Like Watkins , Ken Loach employed documentary conventions in such work as Cathy Come Home (BBC, tx. 16/11/1966) and, although practices change, drama writers and directors continue to seek levels of immediacy by using the documentary conventions of the day (see, for example, Gas Attack , Channel 4, tx. 8/10/2001). 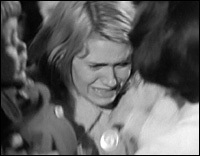 In the late 1960s, a Radio Times editorial by a senior BBC figure set out the Corporation's concern with the drama documentary style, triggered by Loach 's work and by Tony Parker and Roy Battersby 's Five Women, which was ultimately broadcast, substantially edited, as Some Women (BBC, tx. 27/8/1969). Subsequently, politically radical use of drama documentary was criticised or banned outright. Caryl Churchill and Roland Joffé 's 'The Legion Hall Bombing' was just one production to suffer cuts; Roy Minton and Alan Clarke 's Scum (BBC, 1977; eventually tx. 27/7/1991) was banned, while Jim Allen and Ken Loach 's Days of Hope (BBC, 1975) was criticised for political bias in the press and had its approach to political naturalism debated in the film journal Screen. Although these productions provoked long debates on the nature of drama documentary form in the media, academia and the industry itself, it has been suggested that such debate may mask anxieties that are more about political content than form. One argument in defence of the drama documentary form is that documentary and drama cannot be viewed as mutually exclusive, since the assumption that documentary is objective and innately factual is misguided. If factual programming is itself subject to editorial decision-making and narrative organisation, then drama cannot 'corrupt' documentary. Indeed, both Ken Loach and Tony Garnett have argued that appropriating documentary styles in drama is a politically valid approach, since it is merely presenting facts from a different viewpoint than those offered in factual programmes, which are themselves subjective. Despite these pressures, drama documentary remains a pervasive part of British television drama. For instance, there have been many recent variations on the techniques of The War Game , with depictions of hypothetical terrorist attack or social breakdown in Smallpox 2002: Silent Weapon (BBC, tx. 5/2/2002), The Day Britain Stopped (BBC, tx. 13/5/2003), the If... series (BBC, 2004) and Dirty War (BBC, tx. 26/9/2004). However, it is notable that Dirty War was followed by a discussion programme in which the filmmaker defended the programme's content, and that the press criticised dramatised scenes in Derailed (BBC, tx. 20/9/2005), which responded to rail safety as an exploration of institutional culpability akin to Hillsborough . Controversies continue to follow examples of the genre, with no sign of resolution.